Monitor, review and update budgets in real-time! 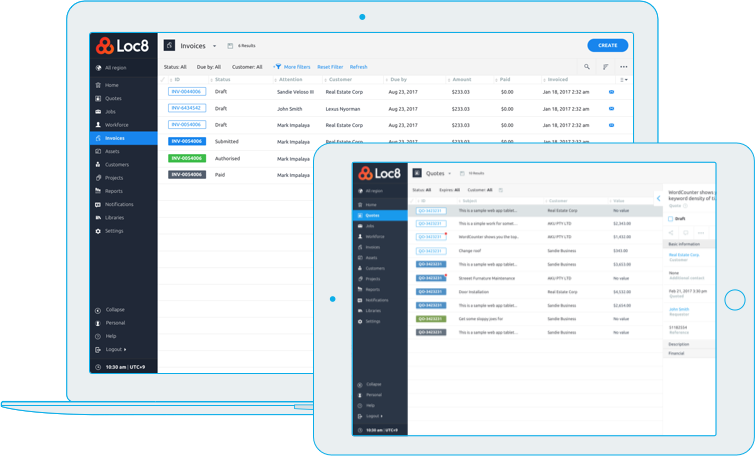 Loc8’s feature-rich budgeting capabilities integrate tightly across the Asset Management, Asset Lifecycle Management and Maintenance Management components of the system providing a user-friendly and intuitive way to manage maintenance and renew budgets across all assets and maintenance plans. Budgets can easily be created within the system and associated with region or specific locations based on work types, asset classes or a combination of funding sources. Loc8’s class leading and best of breed Budgets Management capability will, once configured, automatically calculate the estimated cost of maintaining assets based on existing work, future projects and configured planned maintenance schedules. If the planned maintenance exceeds the available budget, operators can create data models that allow scenarios to be tested to reduce maintenance activity to meet budgetary constraints. Once budgets are set and approved they are published and maintenance plans are automatically modified by the system to only generate planned works that have budgetary approval. The powerful function allows budgets to be monitored, reviewed and updated by approved users in real-time, providing enhanced decision-making capability across any set budget area and period. The Loc8 automation engine is deeply integrated into the functions providing trigger-based alerting and messaging around budgets and their associated asset management and maintenance requirements.